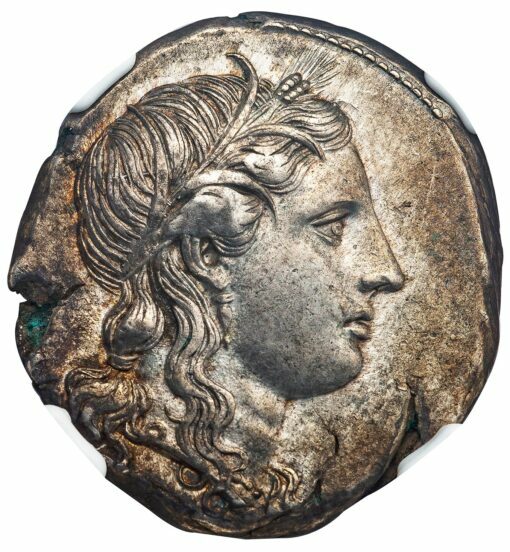 Silver Tetradrachm, 17.12 g., 24 mm., struck ca. 310-306 BC. Rev. 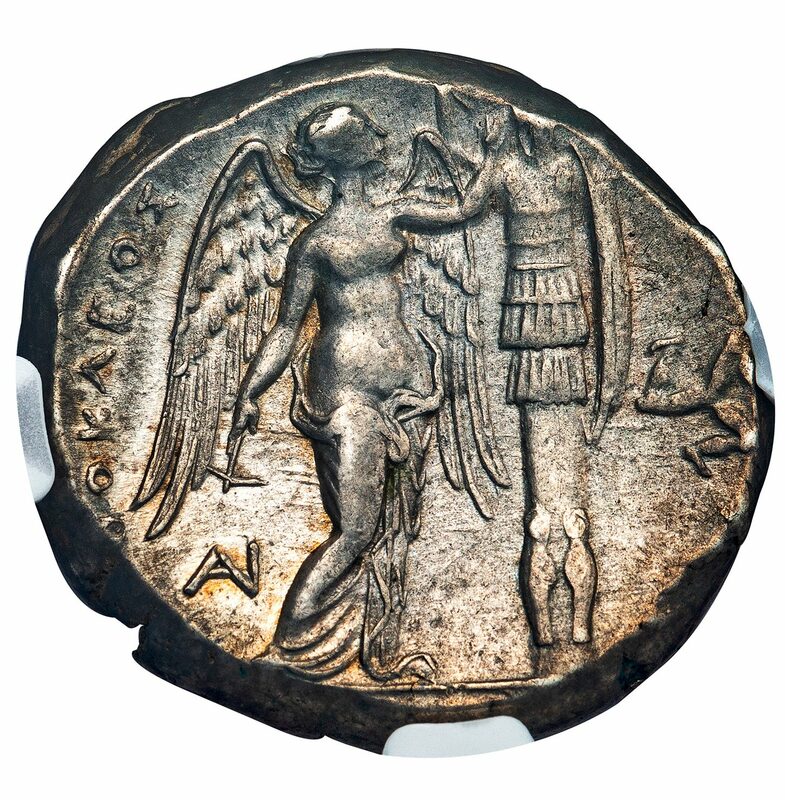 AΓAΘOKΛEOΣ, Nike standing right, nailing armor to trophy, AI monogram beneath left wing, triskeles in right field. Ierardi 100 (O 21 / R 58). 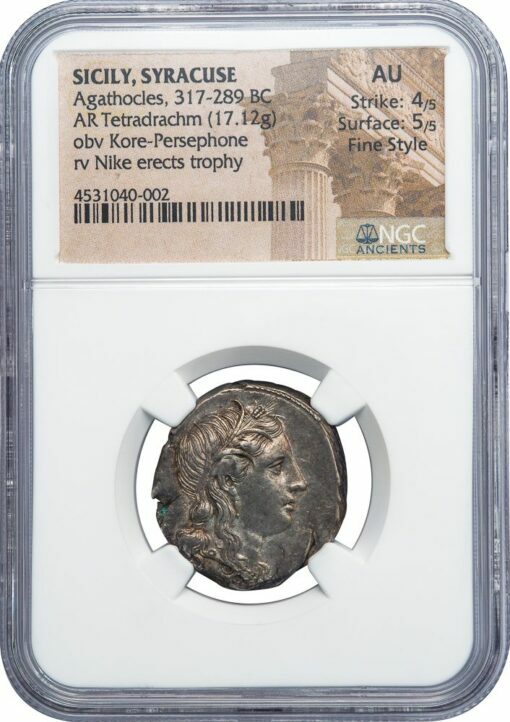 NGC graded AU, Strike 4/5, Surface 5/5, FINE STYLE. This coin belongs to the early part of a series that represents Agathocles’ efforts at creating a totally new type of coinage, different from the Classical Syracuse emissions which he recreated as well. The obverse depicts a delicately classicizing head of the goddess Kore (Persephone). 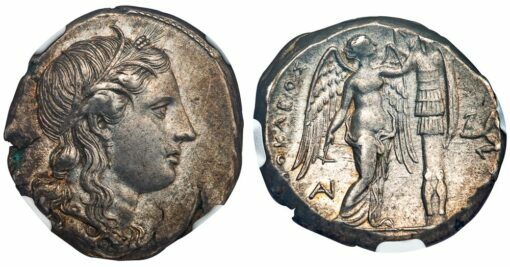 The reverse is devoted to a depiction of Nike (Victory), nailing the enemy’s armor to a trophy, an image that later became a staple of Roman triumphal art. While the early emissions are struck from exceptionally artistic dies, like this specimen, the later products of the same series are of a much cruder style, and some scholars have even suggested that those are not the products of the Syracuse mint.